Two years after the massive explosion of ammunitions which were incorrectly stored at the naval base in Mari, the court in Larnaca has decided on the guilt of the accused in the case. 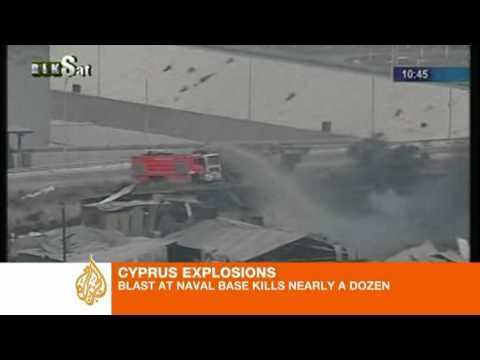 The judicial court for felonies has found former Minister of Defence Kostas Papakostas guilty in connection with the explosion. Former director and former deputy director of the fire department Andreas Nikolaou and Charalambos Charalambous respectively and the head of the special forces of the Cypriot police at the time Andreas Loizides have been convicted on charges of causing death due to reckless, negligent or careless acts or behaviour. The four persons will remain in custody until 24 July when it is expected that their punishments will be announced. This entry was posted on Thursday, July 11th, 2013 at 11:35 am and is filed under CONVENTIONAL WEAPONS. You can follow any responses to this entry through the RSS 2.0 feed. Both comments and pings are currently closed.